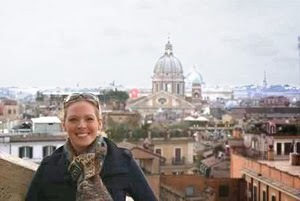 I’ve got a bathroom that needs to be scrubbed and laundry to start, but I’m procrastinating putting everything on hold to bring you an exciting announcement 🙂 95.5 The Fish and Encompass the World Travel are offering a pilgrimage to Rome, Italy and there is room for YOU! It’s a week long adventure, culminating in the Canonization of Pope John Paul II on Diving Mercy Sunday, April 27, 2014. This has been in the works since early September (before the canonization date was even officially announced.) However, with a trip of such magnitude, there were a lot of moving parts and details to lock in before we could share. It is with great excitement I can finally spill the Italian beans! This is truly a once-in-a-lifetime opportunity. Jim and I are humbled and (undeservedly) blessed to be leading the trip, along with Fr. Bob Stec. It would be AWESOME if you could join us. trips). His info and more trip details can be found here. APRIL 24, 2014: You will fly CLE to Rome R/T. be staying for 7 nights, H/B, 2 meals daily ( B,D). sightseeing or shopping. overnight in Rome. ( B,D). St. Paul. Dinner and overnight in Rome. ( B,D). you might want to avail yourself of our optional day trip to Assisi. Included will be all transfers, a walking tour of Assisi to include St.
for dinner and overnight. ( B,D). frescoes. We conclude our visit with a tour of St. Peter’s Basilica. Dinner and overnight in Rome. ( B,D). MAY 02, 2014: (-ROME – CLE ): You will be transferred to the Airport to fly back home. We hope you can come! Arrivederci dio benedica!